Learn about St. George, Utah by reading Enjoy Utah’s Truly Unique Experience! - St. George, Utah by Sandy Zimmerman, Travel Writer. It features a mini, but thorough tour of the destination, plus all you'll need to know to plan your trip including getting there, objective information on places to stay and eat, and things to do. At the end of the article, we've provided a summary of the contact information for your easy reference. Enjoy! Enjoy Utah’s Truly Unique Experience! Photo courtesy of Sandy Zimmerman. Walk around St. George’s historical district to experience 50 restored buildings, monuments to the pioneers. You can see Brigham Young’s winter home and more. The historic district is similar to an outdoor museum of the past preserving their traditions and heritage. St. George is a small town (under 100,000 population) with so much to see and do! There are 11 golf courses, Tuacahn Theatre’s classic musical productions, museums, and more. Sand Hollow State Park offers sand dunes and 40,000 acres of trails for hikers and ATV’S. Australian Pinzgauer Jeep used in the ATV & Jeep Wilderness Tours. Go where Hummers and Jeeps fear to tread! 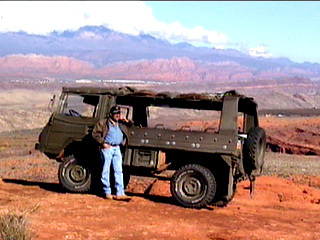 I have taken many safari-style tours, but the ATV & Jeep Wilderness Tours around the back country of St. George, Utah, are a real adventure! They are a bit scary at times; although owner Jim Clay assures me that his Australia Pinzgauer 4-wheel drive vehicle can’t turn over. We travel where there are no roads, as Jim makes his own path over sand, rock, and sandstone. When people said the tour would be action packed, they really meant it! We actually climb up steep mountains. It seems as though we are driving straight up, the jeep is pointing to the sky! Each jagged rock is another step toward the top of the mountain. Sometimes Jim must maneuver over rocks that stick out 2-6 feet. The mountain’s red sandstone colors are striking and the eerie rock formations make us feel as though we are in another world. We have time to walk around and explore. Driving straight down was even a bigger thrill than climbing up. The Pinzgauer was like a mountain goat. Their design gives a Pinzgauer sixteen inches of clearance. The axles swing independently. Jim’s tours are mild to wild. Jim also takes people on night tours under star lit skies, tours during lightening storms, and extreme tours climbing steeper mountains and dropping into canyons. A major dinosaur track discovery was recently found at the Johnson farm in St. George, Utah. While Dr. Sheldon Johnson was digging 35’ below the ground, he found some interesting shaped rocks and wanted to sell them as decorative landscaping. One rock was accidentally flipped over and exposed a cast of a dinosaur’s foot. You can see imprints of dinosaur’s toes, feet, skin, teeth, and jawbone, along with fish fossils. Dinosaurs roamed around here 200 million years ago when this area was a shallow lake a 100 miles long. The sun dried the mud hardening the footprints and mud tracks. Over 1,000 tracks have been found within a 10-acre area. These displays show some of the oldest and best-preserved tracks in the world. One exhibit, the three-toed track, was made by the Dilophosaurus (6-7’ high, 15-20’ long, 700-1,000 pounds). Researchers identified skin prints and impressions made by dinosaurs dragging their tails and swimming movements. The most exciting find is the rare squatting impressions of the dinosaur’s ankle, foot, and tail bone. There is only one other in the world, in China. 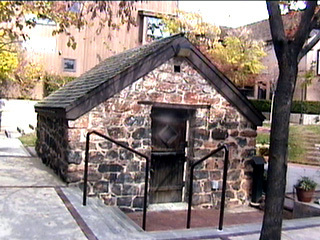 Historic old jail- in Ancestor Square. Within historic downtown St. George, Ancestor Square Shopping Center is the perfect place to see how St. George looked in the 1800’s. The shops, restaurants, art galleries, and offices are either in historic buildings or in those constructed with the “look of the past.” Take a walk around the park, see the old jail, or sit on one of the benches. The Green Gate Village B&B Inn is a collection of 9 restored pioneer homes of the 1800’s. This historic village is located in the center of St. George’s historic district! Relax around the Village’s green landscaped lawn or stroll through the courtyard. Stop by their unique gazebo, 1925 Ford, old-time gas pumps, and buggy. Guests sit in the Bentley House (1876) dining room. 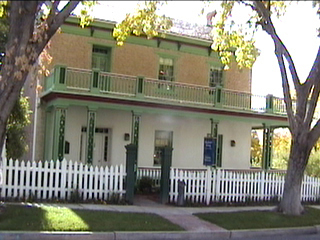 The Orson Pratt House (1862) was the first home in St. George. The green gates (1879) on the east side of the Orson Pratt House are original. Mormon leader Brigham Young ordered white gates for the Mormon Church, but when green gates he gave them to the settlers. Thomas Judd’s Store (1911) is a famous St. George landmark of an early way of life. The Olde Penny Farthing B&B Inn’s beautiful Victorian rose and burgundy cherry colors stand out from St. George’s other historic buildings. Built in the 1880’s, the workers mixed river mud and clay, and then sun baked the bricks. The walls are 18-inches thick with a lava rock foundation. Two large Mulberry Trees decorate the Inn’s entrance while providing shade from the sun. Thousands of antiques and collections of memorabilia cover every corner, windowsill, wall, shelf, and even along the stairs. Some of the bathrooms have old-fashioned claw foot bathtubs and a pull chain toilet. The Olde Penny Farthing Inn is located in the historic district, one block from Brigham Young’s home and St. George’s original downtown. Walk along the quiet tree lined streets to see some of the most beautiful examples of buildings of the 1800’s. The St. George Holiday Inn Resort Hotel & Convention Center is not your ordinary Holiday Inn! With high wood beamed ceilings, a free flowing lobby, and unique design, you realize this is truly a resort! There is room to walk and several areas to relax. The central focus of the Holidome lobby is an indoor/outdoor heated swimming pool. The two pools are joined- swim under the flap and change pools in a minute! Take the catwalk over the pool and watch the activity. There is a great display of historic photos. St. George is located in southern Utah, just 2 hours from Las Vegas, 45 minutes from Zion Canyon National Park, and 3 hours from Bryce Canyon National Park. ATV Adventures - 888-656-2887, http://www.atvadventures.com/. Johnson Dinosaur Tracks - 435-703-002, 2721 Riverside Drive #21, St. George, Utah. Painted Pony Restaurant - 435-634-1700, Ancestor Square, Tower Building, 2 W. St. George Blvd., http://www.painted-pony.com/. Red Lobster Restaurant - 435-656-2811, 263 N. Red Cliffs Drove, St. George. www.redlobster.com/. Samurai 21 Japanese Steakhouse and Sushi Bar - 435-656-8628, 245 N. Red Cliff Drive, #11, St. George. Green Gate Village B&B - Located within St. George’s historical district. 800-350-6999, 76 W. Tabernacle, St. George, http://www.greengatevillage.com/. The Olde Penny Farthing Inn - Inside the historical district. 435-673-7755, 278 N. 100 W., St. George. St. George Holiday Inn Resort Hotel - Families like Holiday Inns because kids (12 and under) stay and eat free when accompanied by an adult! They even offer a special kid’s menu. For golf, theater, and other packages, call the Holiday Inn Resort Hotel and Convention Center, 800-457-9800, 850 S. Bluff Street, St. George. Best Western Travel Inn - 435-673-3541, 316 East St. George Blvd., St. George, www.stgeorgebestwestern.com. La Quinta Inns & Suites - 435-674-2664, 91 East 2680 South, St. George, www.lq.com. Courtyard by Marriott - 435-986-0555, 185 South 1470 East, St. George, www.marriott.com. The Inn at Entrada - 435-634-7100, 2588 West Sinagua Trail, St. George, www.innatentrada.com/index.php. You can check rates and book your room and rental car at WTA’s Online Travel Booking Service. Significant discounts may be available. St. George Chamber of Commerce - 435-628-1658, http://www.stgeorgechamber.com/.